After a very successful start to the 2015 Cold Stone US Open program, CRG USA is primed and ready for the second event weekend of the program as they enter 21 fierce and hungry competitors. Set to take place at their home facility of Grand Junction Motor Speedway (GJMS) in Grand Junction, Colorado, hopes are high for the talented squad as championship point battles begin to take shape. "The CRG USA team had a good weekend at the opening round in Dallas," explained Stacey Cook, Owner of both Grand Junction Motor Speedway and CRG USA. "Despite horrible weather, the MAXSpeed Entertainment crew did a phenomenal job in getting the event in and at the end of the weekend, everyone walked away with a smile. We are looking forward to round two and the rest of the series." Leading the way for CRG USA will be four drivers in the Shifter Elite category as Sabré Cook, Joey Wimsett, Pablo Sanchez and Davide Forè will look to pilot their CRG chassis to the front of the field. Cook enters the event as the point leader on the strength of a consistent showing and podium result throughout the opening round. Hot on her heels in the championship chase is five-time world champion and CRG USA teammate Davide Forè. Wimsett and Sanchez will also be threats for podium results, as the foursome will work together to make sure they are at the front of the field. Just as they do in the Shifter Elite division, CRG USA will enter four drivers in each of the Shifter Senior and Shifter Masters classes. The senior ranks will see the names of Ryan Lankenau, Hannah Williams, Connor Thomas and Colby Yardley, who are all confirmed and ready to race. Yardley was a major threat in Dallas and secured a third place podium result will be the driver to beat. Looking to use his skills to stand atop the podium, Yardley has been hard at work preparing for the upcoming event. 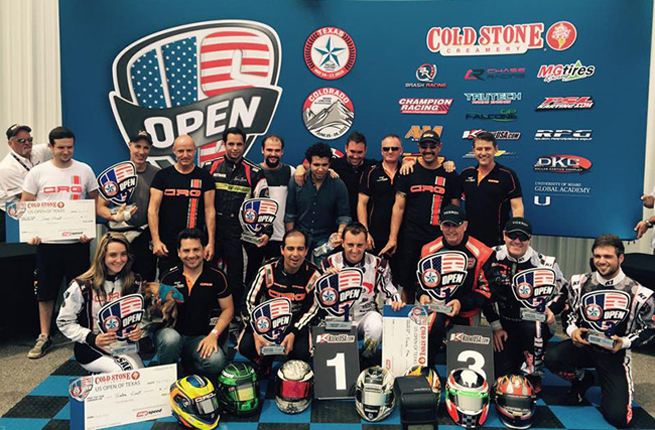 Shifter Masters will see CRG USA drivers Alvaro Pelaez, Emilio Quiroga, Juan Garcia and Javier Etchiverria. Jet Davis will enter the MAXSpeed Entertainment promoted event as the Shifter Veteran leader as he and Cook both look to extend their championship points leads in their respective classes. Davis was the driver to beat at the Dallas Karting Complex and is hoping to carry the momentum through round two and on to the championships. Joining Davis in the Shifter Veteran division will be Hugh Templeman and Dave Conyers. With fifteen drivers in the Shifter ranks, CRG USA will enter six competitors in the Rotax classes as all will enter the senior ranks. Perennial Rotax front-runner Billy Cleavin will throw his hat into the mix for the Rotax Masters victory. He will be joined by Eduardo Espindola, as the duo looks to claim the checkers. Ben Johnson will also be in a Rotax Masters class but he will enter the Rotax DD2 Masters class. Carlos Gonzalez, Sergio Martinez and Mateo Diez will fly the CRG USA flag in Rotax Senior as they look to compete against some of the world's best in the premier Rotax division. CRG USA would like to thank the following for their continued support: CRG Nations, K1, MG Tires, AIM Sports, SwedeTech Racing Engines, Grand Junction Motor Speedway, New Line Racing, Sniper Alignment Systems, Tillett Seats, Viceroy Resorts and Prisma Gauges.